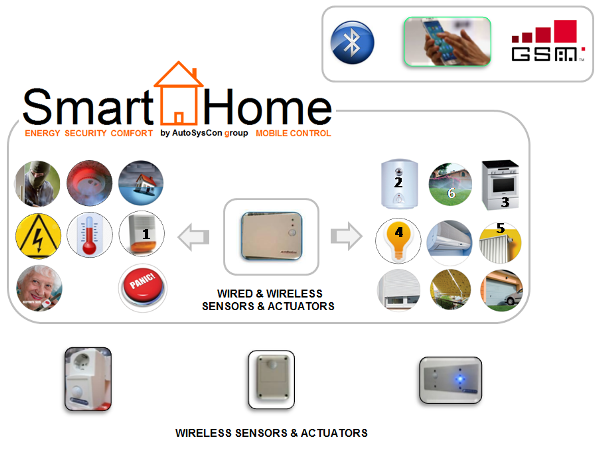 Smart Home Multi-system, without keyboards. Can connect Wired as well as Wireless SENSORS - ACTUATORS. Provides LOCALLY & REMOTELY control. Works locally & remotely via GSM. Can connect Wired as well as Wireless SENSORS, Wired ACTUATORS. Wireless, expandable and works locally via Bluetooth and remotelly via GSM.